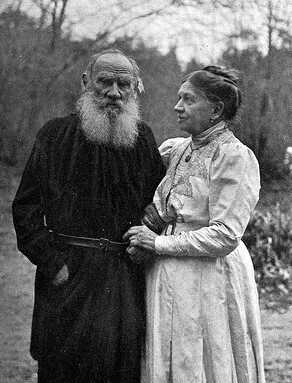 Perhaps Tolstoy understood that all human accomplishment, all of the creative beauty of religion, is not an accident, that it all emerges from an earthly passion for Heaven, from a surrender to God, from spiritual completeness, from a pure and loving heart. Love is a synonym for God; there cannot be anything unclean in it. Even the least perfect and poorly expressed manifestation of love draws to itself what is higher and more creative. “As we become accustomed to crossing ourselves, saying the words of prayer,” wrote Tolstoy, “so we should and must become accustomed to love….” Love widens the senses, transforms them into words, into song, into the beauty of flowing prayer. “It may be that while I am dying, my hand will make the sign of the cross…. Even now, I sometimes cross myself. 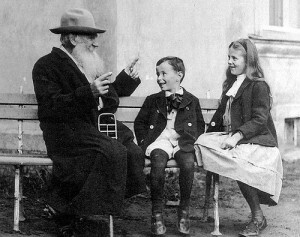 Often, when I sit down to work, with this gesture I invoke within myself a tender religious mood which is connected with the gesture since childhood,” Tolstoy wrote to one of his correspondents three years prior to his death. That far-from-unconscious childish gesture forced him to return to that “happy, irretrievable time” when the young Nikolenka secretly watched the prayer of “the great peasant Grisha.” Grisha was a holy fool who sometimes wandered about Tolstoy’s parent’s estate and even entered the mansion itself and “gave little icons to those he took a fancy to.” He recalled his first confession, when his young soul was filled with a feeling of blessed awe, and the times when, facing ancient icons, his childish lips murmured the words of prayer repeating them after his dear papa. In the last hours of the writer’s life at the Astapovo train station, darkened by illness, extreme weakness and delirium, Tolstoy wasn’t able to consciously cross himself. It was done for him by his faithful spouse, who was allowed to see him only at the very end. Sitting by his pillow, through her tears, Sofia Andreyevna asked him to forgive her. She prayed and was the only one of all of those who were present to make the sign of cross over her dear one. Since 1989 Sergei Romanov has been on the staff of the Leo Tolstoy Museum at Yasnaya Polyana in Russia. Currently he is writing a book, Leo Tolstoy Praying. The translation of this article from Russian is by the author, assisted by Jillian Parker.